The LRC offers extension and enhancement programs such as our well established visiting author program. Each year we invite a minimum of three authors or inspirational speakers to come talk to the students during a lunch time. 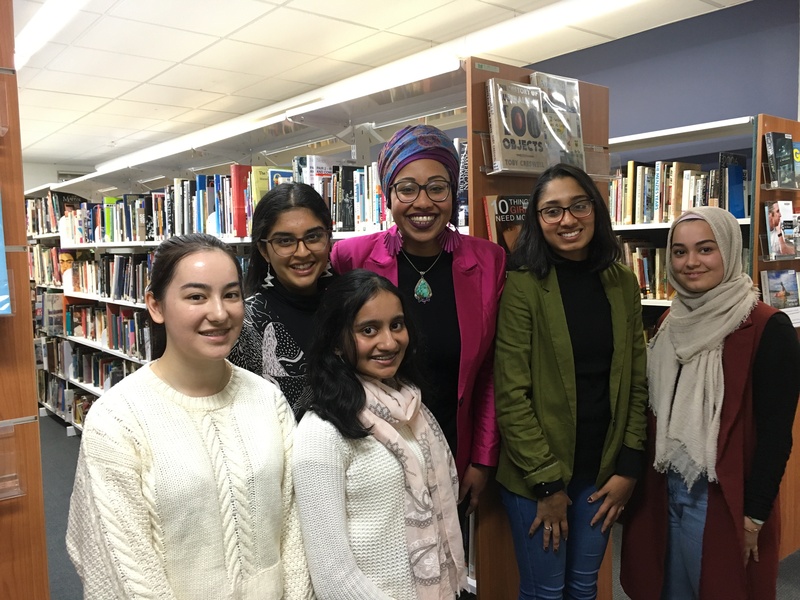 The program makes real connections with student’s passion for reading, and meeting a real life author is a buzz, particularly when they get to ask their questions. The PRC has been running at Mac.Rob for 12 years now. As part of the program, all year 9 students are encouraged to read at least 10 books from the year 9-10 PRC reading list as well as 5 books of their own choice. Many students read well over the 15 books required and we keep a tally of how many books each student, and each class has read, so that we can reward the school's most voracious readers with a trip to the Melbourne Writers Festival. 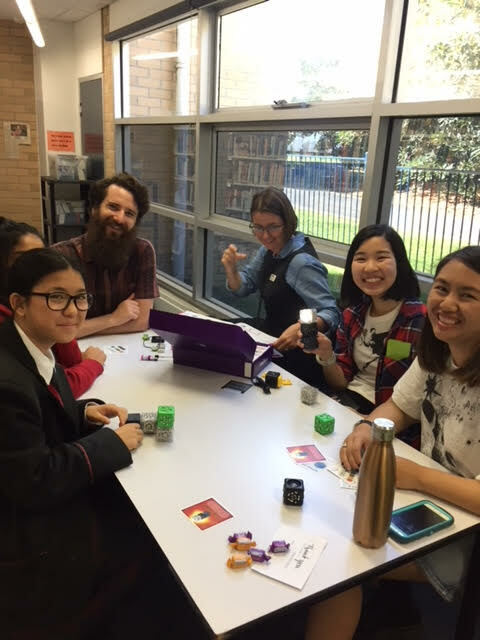 The program aims to facilitate Year 9 form group bonding together as a new group of people, enhance literacy and encouragement of reading at the school, and making the students familiar with the LRC. For more information see our Premiers Reading Challenge Page. We love a good puzzle! The LRC whiteboard is a fun space used for notifications, promoting new resources, and offering regularly updated language and logic puzzles. As well as the daily 9-letter scramble from The Age, we write up puzzles from David Astle's 'Puzzles and Words' books for passers-by to enjoy. Astle will be visiting Mac.Rob on October 19th, and students are encouraged to save up their tricky language questions, to quiz him in return. The LRC Maker Space is a new initiative led by our two IT Co-Captains. Each friday students (and sometimes teachers) get together and construct things, often learning about robotics and programming in the process. So far we have the Cublelets robot construction system and the STEAM toolbox for invention based learning as tools for the students and we intend on getting more tools the students can create and play with in the future. The LRC involves itself in the wider school program in several ways. The Duke of Edinburgh or DOE program is one such example. Students in year 10 opt into this course as an elective choice. Part of the requirements to obtain the award is to participate in a suitable civic or social service. Volunteering in LRC is one way the students can fulfil this requirement. Every year we have two students, usually one per semester, to assist in various activities in the LRC. These include shelving, sorting, maintaining equipment etc. Working in the LRC develops confidence, skills and knowledge of LRC resources and rapport with adults. This years Duke of Ed volunteers are Anika Ghosh and Catherine Xu. The 'Writer in Residence' program was introduced in 2018, with a four day intensive provided by Stella Prize winning author Emily Bitto. The program was very well received by students, who were able to produce their own creative writing and get professional feedback on it. Part of the program is encouraging students to share their writing, and so we have created an e-book that compiles all of the student writing from the 2018 program. You can access the e-book here. In the first two weeks of the school year, the LRC provides full day introductions for all Year 9 classes on the concepts of Information Literacy. Being information literate means having the skills to do effective research in today's 'information age'. Over the day, students learn about the six stages of research, where to find resources in the library and how to judge information currency, reliability, authority, accuracy and purpose (objectivity). We hope that these classes will make the year 9s more savvy researchers and allow them to fish out 'fake news' when they see it. Once a year at Mac.Rob we have a morning tea and easter egg hunt for staff in the LRC. This event is attended by nearly all staff members, and they have a lot of fun searching for easter eggs the students have hidden all around the library. They can also just have a relaxing tea and hot cross bun, with the school holidays not far away. The LRC uses regular displays to promote items in the collection. From much loved favourites to hidden gems to award winners. Previous displays have included Women’s History Month featuring biographies from inspriational women, Dr Seuss' birthday, audio books, cooking and Australian YA. We have many more exciting displays in store this year so make sure to come visit us and see what new books we have for you all! The LRC houses a “study free table" in the fiction reading area. This area provides a number of quiet and relaxing activities that stimulate the mind, while allowing students to take a break and be creative. In the past students have created silhouette art made from magazine cuttings, as well as done some beautiful colouring in work. We have some 1000 dot-to-dots for students to complete and have many more ideas that allow for mindfulness and relaxation time in between all the hard study students are putting in.